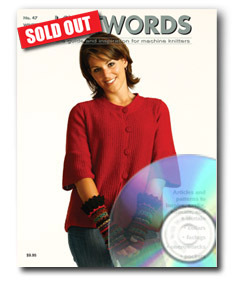 PREVIOUS ISSUES OF KNITWORDS ARE AVAILABLE, WHILE SUPPLIES LAST. 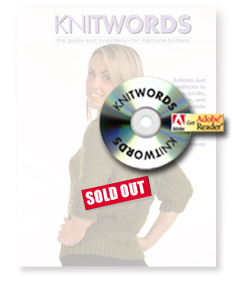 Starting with issue 41... when printed copies of KNITWORDS are sold out you can still order them on CD! 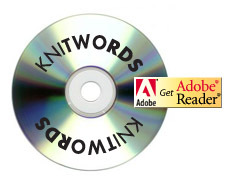 The CD contains the entire KNITWORDS magazine in printable PDF format (Adobe Acrobat is a free download available at www.adobe.com). Use the order form link at the bottom of this page to order. Price is $75 post paid. Tumbleweed, It's a Tie, The Chronicle, Tobacco Road, lady’s cardys; I Heart U, Leafy Lace, girls lace cardys; Ar-guy-le, boy's vest; Send in the Clouds, Midnight Sun, lady's summer tops; A-shirred, lady's hoodie. 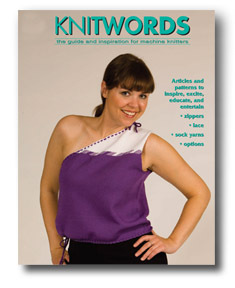 9mm, Rib'n Shrug, lady's; Neck Tech - 6 scarves. Do it in DAK-slice&dice the pieces; The Punchline - how to for punchcards; W5 cast-ons; Building Bridges.18 patterns, 4 articles. CLICK ON THE COVER IMAGE AT LEFT FOR AN INSIDE PEEK AT ISSUE 53. 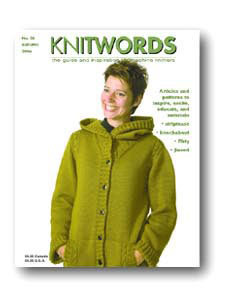 Mid Gauge -Tomato Soup (cover); girl’s zip front sideways hoodie child’s raglan hoodie;Kindred, lady’s cardy. 4.5mm - Needful, StandUp, lady’s cardys; Survival Hoodie, child; Frill Ride & Peachy Kean, lady’s cardys; My LBD, lady’s shaped dress; White Diamonds, tween g carriage shrug; Herringbone, lady’s fairisle jacket. Do it in DAK-converting schematic; Darting Around, vertical darts; Grafting; Colour - analagous. 15 patterns, 4 articles. CLICK ON THE COVER IMAGE AT LEFT FOR AN INSIDE PEEK AT ISSUE 52. No 50. Mid Gauge - 2 lady’s jackets; lady’s shrug. 4.5mm - Kid’s - girl’s cardigan, child’s hoodie. 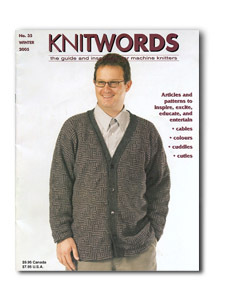 Easy Peasy, shrug; Plumline, lady’s cardigan; Texturized, tuck henley; Preppy (cover), cardi; Popcorn, tuck vest; Mono Blues, cardi; Eh? Game, doublebed, cardi; Felt Like Ruffles, purse; Get Lei-d, tam, scarf & mitt set. 14 patterns, 4 articles. CLICK ON THE COVER IMAGE AT LEFT FOR AN INSIDE PEEK AT ISSUE 51. The print version of No. 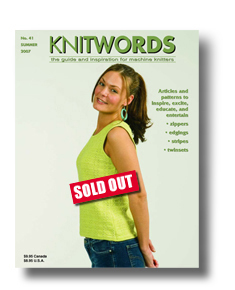 50 is SOLD OUT, however the complete issue of KNITWORDS No. 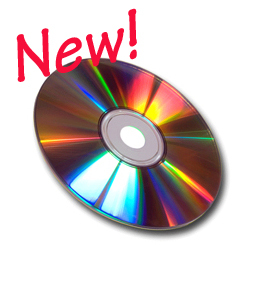 50 is still available in a fully-printable	pdf document on CD. Adobe Acrobat Reader required. No 50. 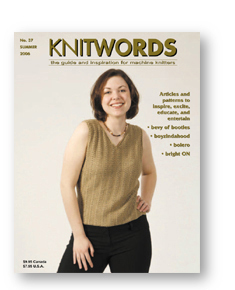 Mid Gauge - Midway; Home Tweed Home; lady’s cardis.4.5mm - Pretty Picots, child’s jumper; Flip Side, child’s vest; Tuck & Weave , vest; Squared Off, tunic; Flouncing Around, Wild Side vee cardis; Snug Shrug, ribbed shrug; Just Ribbing, ribbed Aline cardi; Geezer Chic, long cardigan; Spots in Dots, lace tunic. G Carriage, Buttoned Down, girl’s cardi. Do it in DAK - converting clipArt; One Row Tuck Textures; Open your Eyes to Shortrows; Ribber Rrules 5, 3X3 rib; Future Fairisle. 15 patterns, 5 articles. CLICK ON THE COVER IMAGE AT LEFT FOR AN INSIDE PEEK AT ISSUE 50. No 49. Mid Gauge - child’s hoodie, lady’s summer top. 4.5mm - girl’s hoodie, lady’s summer tops and cardigans, girl’s dress... LOTS OF SUMMER STUFF! Passap, baby set. 3.6mm - lady’s zip top. 18 patterns, 4 articles. CLICK ON THE COVER IMAGE AT LEFT FOR AN INSIDE PEEK AT ISSUE 49. No 48. 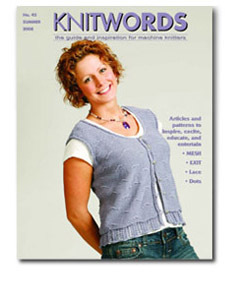 Mid Gauge - All-Aruffle, shawl; Almost Seamless, shrug; Blue Ribbon, lace top; Ultimate poncho. 4.5mm - Love & Kisses, little girls' hoodie cardy; Made to Match, boy's hoodie; NVee, lady's top; Me-Cozy, lady's lace hoodie; Barely There, lace cardy; Spring Bling (cover) girl's vest, socks and wristlets; Crosswise, lady's raglan short sleeve cardy; Dragonfly threadlace shawl. 4.5mm double bed, Threeway, lady's cardigan. Passap - crib & car seat blankets. 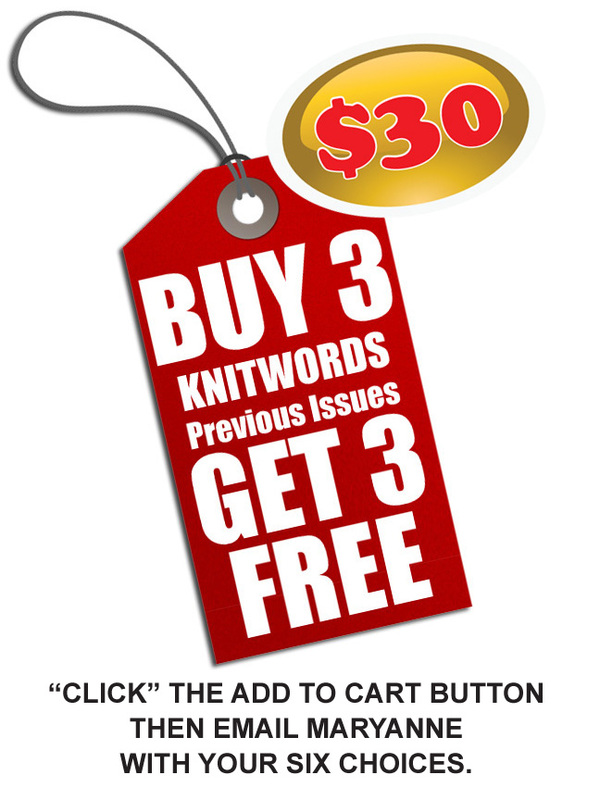 Looking at Lace, Part I; Do it in DAK, FAQ's. 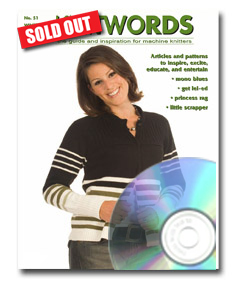 14 patterns and 5 articles. CLICK ON THE COVER IMAGE AT LEFT FOR AN INSIDE PEEK AT ISSUE 48. Mid Gauge - NJA Hoodie, child's duffle. 4.5mm - Sugar 'n' Spice, child's tunic dress; Let it Snow, child's pullover; Simply the Best, lady's cardy with pleated, curved patch pocket; Denim & Bling, lady's tuck, collared cardy with inside patch pocket; Groovy (cover) lady's A-line cardy; Tiers of Joy, 3 tiered skirt; Knitty But Nice, lady's Aline pullover top; Circle of Life, circle cardy; Form Fit, one-row-tuck shell; Just the Flax, lady's linen cardy; Lighter shade of Pale, lacy pullover top; She Wore Pearls, lady's cardy with tuck & pearl bands. Mosaic Knitting 11; Do it in DAK, shapes/baby garment. Extras - Fisti-Cuffs, wristlets; Victoriana, evening bag; Hip to be Square, woven scarf. 13 patterns, 2 articles, 3 extras. CLICK ON THE COVER IMAGE AT LEFT FOR AN INSIDE PEEK AT ISSUE 47. Mid Gauge - Dress Code (cover) Wild Oats, tuck coat; 4.5mm - School Days, chld’s cardigan; Print It, lady’s cardy; Best Bib ‘n’ Tucker, lady’s tunic; Henley Her Way, lady’s top; Curve Appeal, lady’s cardy. Passap - man’s sock; Two left feet scarf. G-Carriage - Barcelona, girl’s cardy; Bonhomme, scarf. Double bed - two left feet scarf. 15 patterns, 3 articles. Mid Gauge - PurlyGirl (cover). 4.5mm - Kewl, child’s mesh tank; Canada Day, toddler sun dress; Dots Across, lady’s camisole; Lace Effect, woman’s baby-doll top; Linen Mix, vee neck cardy; Coquette, lady’s sideways top; Alhambra, kimono style dress; Primrose, sideways cardy; Matte Finish, lady’s top; Mazatlan, lace cardy; Exit Line, lady’s top. G-Carriage - Baby Chic, small girl’s cardy. Passap - Child’s Socks. 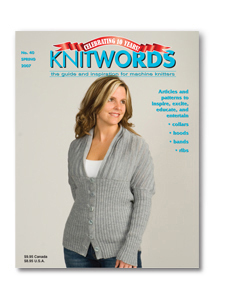 Do It In DAK, 9 Habits For Success; Create Your Own Self Striping Yarns. 14 patterns, 3 articles. 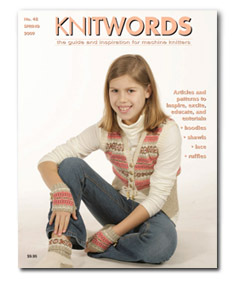 Mid Gauge - ZigZagged (cover); McNathan, child’s saddle shoulder zip hoodie; 4.5mm - Hoodwinked, baby hoodi ; Fashion Fringe, girl’s tunic; Draped, lady’s cowl necked top; DogOn, zip hoodie; Let’s Swing Again, trapeze cardi; Plain Vanilla, cardi; Double bed - Outlines, zip raglan. Shopping bag. 15 patterns, 4 articles. Mid gauge - Fringe Festival, child & doll vest; Regular Joe, man's pull; Trapeze Artist, lady's swing jacket. 4.5mm - Heirloom, christening outfit; Dudette, lady's shawl collar pull; Gadabout, pleated peplum jacket; LuLu, lady's short evening dress; Nonchalance, cover cardy; Caped Wrapper, lady's cardy. 4.5mm double bed - Zippily, child's English rib cardy; lady's vest. Ribber Rules 4; Baby Hats; Do It in DAK, using Dingbats. Tuck Lace Special! Mid gauge - Groovy Girls (cover - adult, child, 18" doll); Dude! 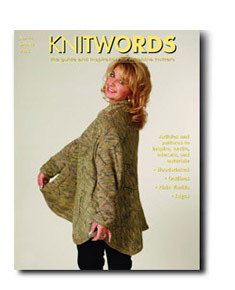 - child's shawl collar pullover (LK150); Simply Sage, lady's jacket. 4.5mm - Cocoa Beach, lady's coverup; Clematis, lady's v-neck top; White Out, lady's zip cardy; Art Deco to Go, Lady's coat; Paisley Print, lady's 2 pc suit; Body Basic, lady's top with neck variations. 4.5mm Double bed - Big Sister, lady's bigshirt. Be Your Own Designer4, asymmetrical shapes; Out of Work? tuck lace; Sales Savvy; Do it in DAK - fine tune to size. 15 patterns, 4 articles. 4.5mm - Citrus (cover); Charlie, lady's fitted jacket; Double Feature/Close Second, zip cardy and sleeveless tank twinset; Juxta-pose, striped cardy, sleeveless top twinset; Peekaboo, Faux Lace, lady's sleeveless tops; Window Dressing, lady's cover-up/tunic; Tiger in Training, child's golf shirt, doublebed. GCarriage - Girl (and her doll) Power, girl's/18 in. doll big shirt. 6.5mm - Baton Rouge, LK150 lady's cardy; For Phoebe, child's dress; bassinet blanket. 9mm -Randomly, lady's pull. Ribber Rules, part 3, longstitch facings & circular hems; Be Your Own Designer, part 3 - alterations, charting device; Do it in DAK - more on words and fonts. 16 patterns, 3 articles. 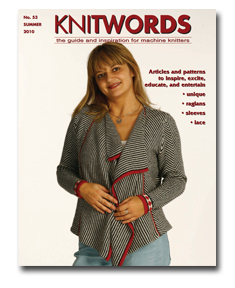 4.5mm - Hem 'n Haw (cover); Studio 60, lady's cardigan; Reddy-to-wear & Raglan for all Reasons, twinset; Lacy in Red, lady's lace hoodie coat; Poet and Peasant, lady's empire top; One for the Road, child's pullover; Lite'n Luvly, lady's boatneck; Two for Tweed, lady's top; Mensware, saddle shoulder zip neck pullover, doublebed. 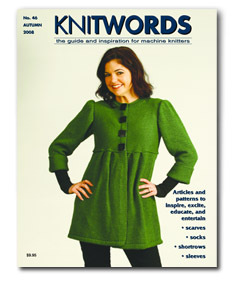 6.5mm - Lime Soda, hoodie vest; North of 49, Mary Maxim style cardigan, electronic with ribber. 9mm - Huggable Hoodie, child. Ribber Rules, part 2; Be Your Own Designer, part 2 - unusual pieces, charting device; Do it in DAK - the abc's; Shape the Unusual, part 2 - DAK; Cardiganize, turn pullover into; Spare Ribs, more double bed stuff. 13 patterns, 8 articles. 4.5mm -Faded Favour - man's v-neck beginner; Hip! 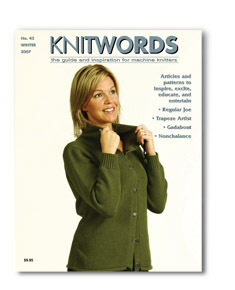 lady's cowl neck tunic; Pretty Peplum, lady's cardigan; Tie One ON - lady's twinset; Sport Utility - lady's zip jacket; Winter Weave - vee pullover; Batternburg - lady's tunic. Beginner doublebed: Nathanware - child's zip saddleshoulder; Opposite Attraction - lady's cardi; Warm Up Sox. 6.5mm: Dramatic Departure; Shortly; Fringe Factor - ladys cardigans. Ribber Rules, part 1. Shape the Unusual - DAK. Be Your Own Designer, part 1 - charting device. 16 patterns, 4 articles. Beginners Style File, No 5 - strip knitting. 4.5mm - in da 'hood, adult raglan hoodie; Go Vogue, lady's tiered skirt; Lilac Luxe, ruffled lace cardigan; Sandra Dee - sideways bolero; Knockabout - g carriage blazer; New Slant, lady's raglan; Norske, child's fairisle; Fit to Be Tied, lady's tieneck top; Tweed Tuck, 2 col. tuck blazer; Business Flirty, lady's suit. 6.5mm: Jinxed, cover jacket; My Favourite Thing, child's intarsia pullover. 3.6mm: Fine Tuned, lady's cowl. 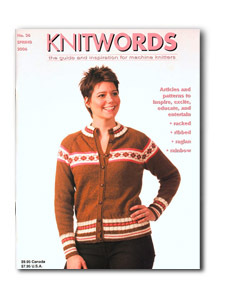 DAK, intarsia & knit from screen; Double Talk, English rib in pattern. 16 patterns, 5 articles. Beginner's Style File, No 4 - baby booties. 4.5mm - child's raglan hoodie; lady's summer tops; Match Set, tuck and tucklace twinset; Two-in-One, fooler twinset; Good to Go! lady's 2 pc dress with lace; Lace it Up, lady's border print lace cardigan. 6.5mm: Open Season, lady's bolero. 9mm: Summer Fun; Bright On - lady's summer tops. 3.6mm: Darling Duet, girl's cardy and matching doll; Fine Meld, lady's cami. Shortrows; Ribbon Rap; Socks - tuck & slip techniques. The cable issue! 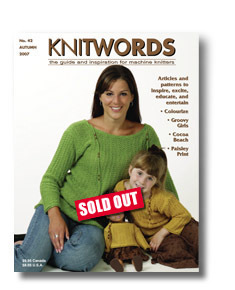 Mid Gauge - Over the Rainbow (girl and her doll); Knit Big or Go Home; Plum's the Word double bed mid. 4.5mm - Beginner's Style File, baby dress; 2 boleros; Goes with Camo, child's hoodie; Neapolitan - cover raglan; Take a Turn, beginner cable v-neck; Mandarin Star, lady's rev. coat; Zigzag, racked pullover, double bed. Passap - drop lace bolero. 3.6mm - Fine Print - lady's fairisle cardy. Felted bag. 16 patterns, 5 articles. Beginner Style File 2, Minnesota Mittens, Rufflemania scarf, Fuzzy slippers, Pretty Baby Ponchini, Felted Kitty, 4.5mm & 9mm felting projects. 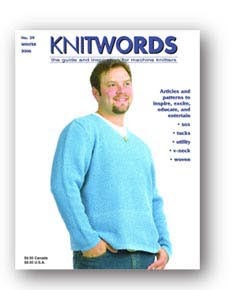 4.5mm - single bed: Made to Fade, lady's v-neck stockinette pullover. Violets, lady's blazer style cardigan, tuck. Colourfast, colour blocked cardigan with reverse seaming, slip stitch. Make Room for Baby (maternity). EduDog, child's blanket. Starving Artist Gloves, fingerless. 4.5mm doublebed for bands - Putting on the Ritz, lady's long, buttonless stockinette cardigan. Casual friday (cover) man's blazer style cardy, 2 colour tuck. 4.5mm doublebed - L'il Sport, little boy's cabled vest. Mid Gauge - Bijoux, stockinette angora lady's bolero. Viva Glam, plaited stockinette lady's cardy. Honeycomb, 3 pc tuck baby set. A Pair of Dolls, girl's folk art cardy, fairisle with doll's version on 4.5mm. 9mm - Hug Me, child's cardy. 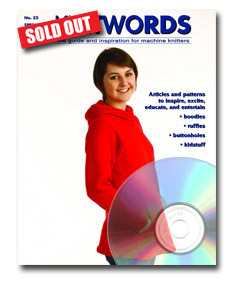 20 patterns, 5 articles. 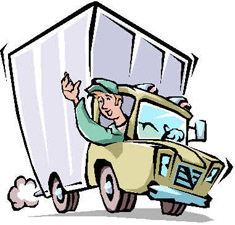 SHIPPING OUTSIDE CANADA & U.S.A.